No. 1 Sketch of the Public Surveys in Kansas & Nebraska. 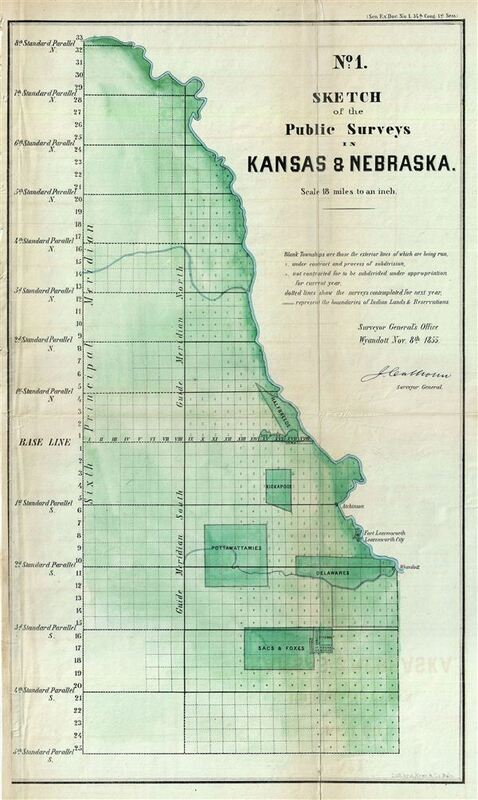 This is an attractive example of the 1855 public survey map of Kansas and Nebraska prepared by J. Calhoun, Surveyor General of Kansas and Nebraska. This map covers the platted portions of eastern Nebraska and Kansas. Most of the significant survey work is limited to the lands to the west of the Missouri River, with hundreds of square plats labeled with an 'S' to denote that they had been fully surveyed or a 'T' to suggested that they were only superficially surveyed. This survey also identifies various Indian lands and reservations, including those assigned to the Sacs & Foxes, Halfbreeds, Delawares, Kickapoos, and others. Fort Leavenworth, the traditional starting point for most overland routes westward, as well as the villages of Wyandott and Atchinson, are also noted. This map was printed by A. Hoen & Co. and prepared by the Surveyor General.